Emily will age out April 2019! She has repaired lip and palate and the sweetest smile! Her speech is a bit delayed. She can recite children’s rhymes, but her pronunciation in not very clear. She enjoys playing with kids older than she is and likes to be praised by adults. 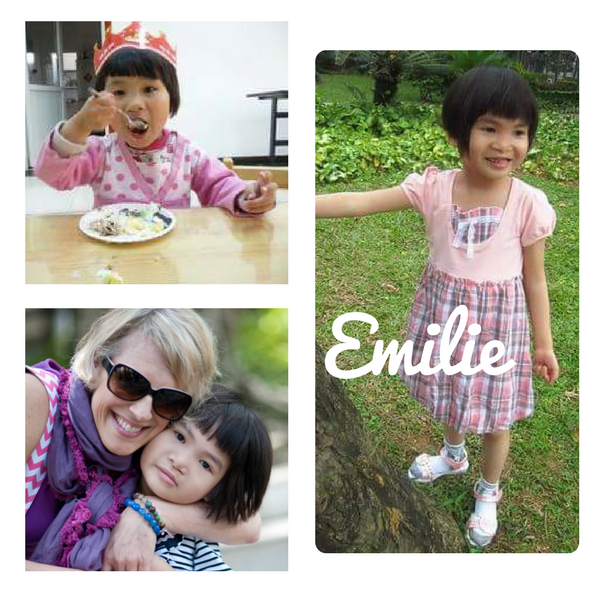 “Emilie” is at grade 6 of a local special needs school, her study is great compare to other kids in the same school. She would like to be adopted. “Emilie” is very athletic. She is very sensitive to the change of the environment. When she gets into something she likes, she would keep doing and don’t want to stop. She is doing great at her school. She got “best student” “Star of the school “”Excellent dancer ” reward at school. She has a routine. She is not picky on food and she is a good sleeper. She goes to school from Monday till Friday and come back to the orphanage at the weekend. She gets up at 6-6:30am, go to school at 8:30 after breakfast. She has her lunch at school and finish school at 15:30, She has dinner at 18:00 and go to bed at 21:00. At school, her subjects are Chinese, Math, Music and handicraft. She has great self-care ability. She plays with other kids but she prefers to do her handicraft and watch TV. She received cleft lip and palate surgery, after surgery her speech is still not super clear. She likes to communicate with body language and she has no problem to understand what others say. Her mental development is delayed compare to the kids her age. Her cognition is good, Fine motor skills are great. She is not so good at understand abstract concept. We believe she will make great progress when she returns to a family. She loves music, dance and handicraft. 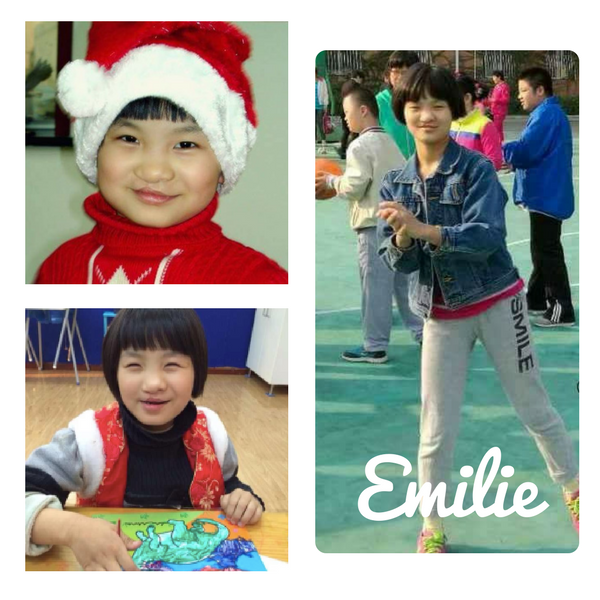 General situation: “Emilie” is a quiet girl, her athletic ability is very good. She can jump freely, her fingers are flexible, ingenuity, more sensitive to changes in the environment, more interested in doing her own things like crafts. It can take her a while to learn a new skill, but we believe in a good environment she could learn faster. She attends school, during this year she won the “good students”, dance performances “Excellence Award”, “Guagua Star” and so on. Diet and sleep are good, good appetite. From Monday to Friday she attends school and is a boarding student; Friday to Sunday evening she comes back to the orphanage. 6: 00-6: 30 every day to get up, wash, eat breakfast; 8:30 to school classes, noon in the school cafeteria to eat, 15:30 pm school, 18:00 dinner, 21:00 or so to sleep. School courses are: language, mathematics, music, art, social adaptation of integrated practice, sports. “Emilie” has good self-care ability. She can care for her own needs. 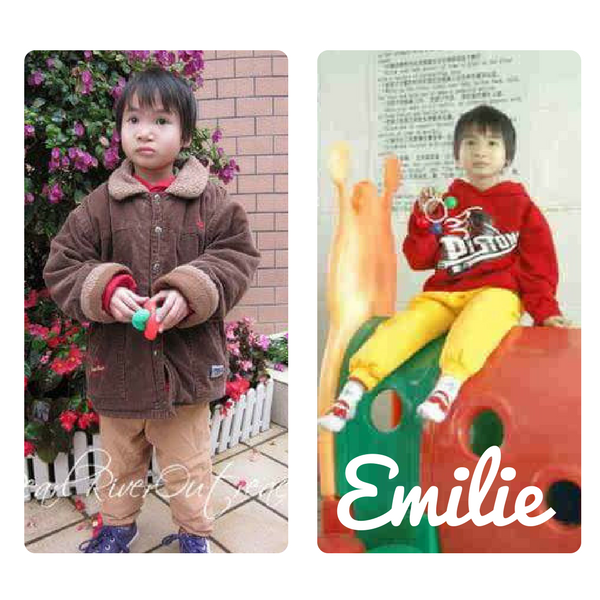 “Emilie” can play with other children, but most of the time she likes to do hand crafts, watch TV and so on. Cleft lip and palate surgeries improved the look of her lip and palate, but her speech is not clear. Communication is not a problem with the use of the communication card and body language. However, in talking with people who do not know her well the communication is poor because of her lack in expressive speech. She is able to understand what people say. Her mental development compared to other children her age is not as good. She has good cognitive knowledge, a good memory, good fine motor skills, good gross motor skills, and her imitation ability is good. She is not good with abstract concepts but can complete a task with a lot of oral instruction. She needs more training in social adaptation. We believe her current living environment is relatively simple, and not helping her language and cognitive development. In a more stimulating environment there will be a big improvement.